Imagine not being able to own a dog or to interact with one because of medical problems or social isolation. If you are a dog lover, this is an unimaginable loss, yet one that is faced by thousands of senior citizens. Caregiver Canines began to bring to the homebound elderly and those suffering with dementia the joy and companionship that only a dog can bring. Caregiver Canines enriches people's lives – both the volunteers who visit with their dogs and they people they visit and their families. How does Caregiver Canines Work? A certified therapy dog and their owner accept an assignment to visit with an older neighbor. The visits take place about once every other week and last for about an hour in the senior's home. This allows for a deep friendship to form between the handlers, the dogs and the people they visit. What makes Caregiver Canines Different? Most therapy dogs visit institutionalized settings such as hospitals and nursing homes. Caregiver Canines uniquely visits people in the comfort of their own homes where they receive one-on-one attention. The bond that forms between those visited and the dog team is incalculable. Dogs are known to reduced stress and loneliness and to improve the health and self-esteem of those they visit. When the care recipient is happy, the caregiver is happy too. Simply put, our Caregiver Canines dogs make every person and household they visit feel special! Reduce stress and loneliness to improve health and self-esteem request a Caregiver Canines visit! 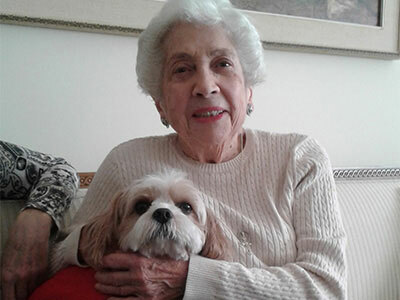 The homebound elderly experience joy and companionship by therapy dog visits. Hearts and Hands is an affiliate of the national Caregiver Canines organization. Our no charge visits are distributed through the National Volunteer Caregiving Network. A certified therapy dog and their handler are matched with a senior to make a one-on-one visit several times a month for about an hour.